Gold and silver futures eased for a second session in a row Thursday as the European Central Bank kept is stimulus program unchanged. Gold for December delivery declined $7.60, or 0.6%, to settle at $1,341.60 an ounce on the Comex division of the New York Mercantile Exchange. "The pullback has everything to do with the ECB confirming the status quo as it pertains to [quantitative easing]," MarketWatch quoted Adam Koos, president of Libertas Wealth Management Group. "Adding insult to injury, Super Mario Draghi [the ECB’s president] rubbed salt in the wounds of stimulus hopefuls, saying that ‘expectations were again too high ahead of (the) decision’." 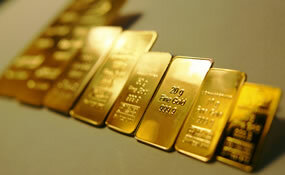 Gold futures ranged from a low of $1,339.10 to a high of $1,353.90. They dipped 0.4% on Wednesday after surging 2.1% on Tuesday to log their highest settlement since Aug. 18. Meanwhile, silver for December delivery lost 17 cents, or 0.9%, to settle at $19.678 an ounce. Silver futures traded between $19.63 and $20.02. They fell 1.4% in the previous session after soaring 4% on Tuesday, marking their best close since Aug. 10. October platinum fell $8.10, or 0.7%, to $1,084.70 an ounce, ranging from $1,082.80 to $1,100.60. Palladium for December delivery shed 50 cents, or less than 0.1%, to $687.85 an ounce, trading between $682.80 and $698.15. Gold fell $4.95, or 0.4%, to $1,343.40 an ounce. Silver added a penny to $19.93 an ounce. U.S. Mint bullion sales advances included 11,250 ounces in gold coins, with splits of 10,250 ounces in American Gold Eagles and 1,000 ounces in American Gold Buffalos. Below is a sales breakdown of U.S. Mint bullion products with columns listing the number of bullion coins sold during varying periods Products with an asterisk (*) are no longer available. This is no surprise, given the Mint sold ~100,000 1/4 oz. coins today. In other shocking news, all three of the major news outlets announced that the sky is blue.